Banish that unwanted popcorn texture and lift your ceiling to new heights with these DIY solutions. While popcorn is almost always welcome during a trip to the movies or a viewing of your favorite TV show, there is one place the texture of this favorite treat is generally not wanted: on your ceilings. 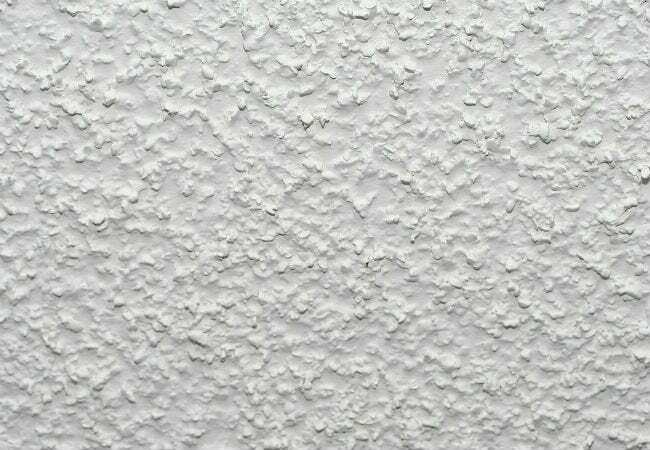 Popcorn ceilings were a fixture in homes from the 1950s well into the ’70s, but their presence today has a way of making a space feel more old-school than cool. 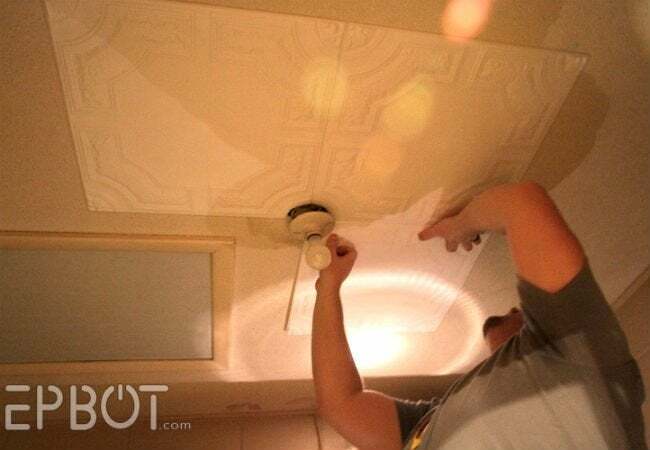 Rid your rooms of this outdated ceiling treatment using one of these three smart and stylish solutions. Before embarking on any of these methods, first test your ceilings for asbestos. You do not want to ingest or inhale the dangerous fibers that can come loose during your project. If an at-home test reveals that your popcorn does contain asbestos, leave any alterations to the pros. If you can scrape together humble household paraphernalia like clear tarp, a flat-edged metal scraper, and a putty knife, you can scrape off that popcorn ceiling. Start by removing as much furniture as possible from the room, and then lay the tarp completely over the floor, radiators, and whatever else remains. Duct-tape the seams together and use painter’s tape to secure the tarp to the wall, creating a big concave sheet to catch all the debris. Next, get up on a steady ladder or stool and moisten a square area of the ceiling with water. Holding the scraper at an angle, use it to gently slide the popcorn texture off; work around hard-to-reach edges with a putty knife. When the ceiling is clear, bundle up the popcorn-filled tarp and dispose of it. Fill and sand any ceiling holes with spackling compound, and wipe the ceiling smooth with a damp cloth. Finally, prime the bare ceiling and paint it, reveling in its newfound smoothness. 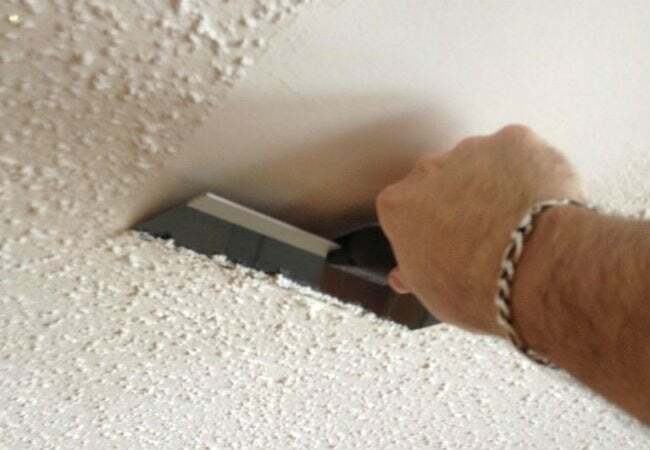 Although scraping is an effective way to get rid of a popcorn ceiling for good, the process can be more than some are willing to undertake. If you’re not ready to tackle the job, consider concocting a clever cover-up using decorative tiles instead. Styrofoam versions like these are not only inexpensive and customizable, but also easy to cut and install. Calculate the number of ceiling tiles needed to cover the area, and then use an X-Acto knife to slice the Styrofoam down to the desired measurements. Dab construction adhesive on the tiles, and then press them onto the ceiling, ensuring that they fit flush next to each other. Caulk the lines for a seamless finish. 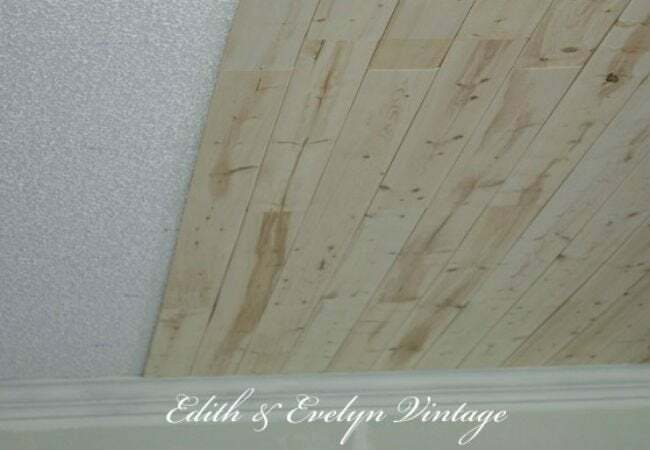 If popcorn ceilings are seriously compromising your decor, give them a modern makeover with rustic wood planks. While a higher-grade wood may be easier to work with, a thinner, lightweight version—like the planks that Cindy of Edith & Evelyn Vintage uses here—can suffice just as well and will cut down on costs. To get the look in your own home, start by using a stud finder to identify the ceiling joists, then mark them with chalk. After painting or staining your wood to suit your style, apply Liquid Nails to the back of each of the wood planks, and then nail them into the ceiling joists with a nail gun. Although this project requires a friend or family member’s helping hand and a great deal of patience, you’ll be delighted with the results when you gaze in joy at your ceiling that (finally) reflects this decade’s design choices.